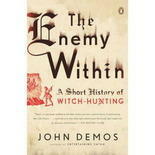 I just finished reading The Enemy Within: a Short History of Witch-Hunting by John Demos. It takes you through literal witch hunts starting as early as 150 A.D. Of course it gets a bit heavier in detail during the big European one and especially during the Salem Witch hunts, which apparently had very good records. At the end of the book he goes into the figurative witch hunts. The hunt for Masons, Red Scares, child molesters in the 1980s and such. The writing is a little dry. I had to take a break half way through and restart it later. The descriptions are thorough and very well organized. He describes what happened. The trials, the accusers, the accused and the officials that encouraged it all. After telling the events of a certain set of witch hunts, literal or figurative, he goes into the causes. Was it a reaction to the break down of social structure? The fear of religion? People getting high? Fear of Native Americans? There are a lot of theories he presents and he does a very good job of explaining the basic strengths and weaknesses of each. The one point that I found most important, and why I thought this book was appropriate to review in this blog, is that it wasn’t all women. The stat he gives in the book was that, in both Europe and America, it was about 4 to 1 more women than men. However, people forget that this was not just a persecution of women, men were involved, too. Demos does a good job of keeping the reader aware of that, while still painting the picture that it was often, if not mostly, women accusing women. When men got involved it was often because one of their female relatives was accused. The Enemy Within does a good job of describing nearly 2000 years of history 295 pages. Demos doesn’t get bogged down in details, but, as far as I can tell, hits all the important points. His writing is a bit dry, but with a topic like this that is probably a bonus. It would be very easy to turn the topic into an impassioned speech for any number of social justices. I recommend this book to anyone interested in persecutions, “witch” history or group psychology.